I am preparing to paint the Great North Wall of the Cross House, the facade to the left. The main facade, to the right, was repainted in 2014. The colors I am using are the original 1894 colors, based on computer-matched samples discovered in 2014. The walls were a gold olive. The trim was a green olive. And the window sashes were a black olive. The above image, when the house was brand new, proved invaluable in determining what was Light and what was Dark. If you click on this image, it will enlarge. 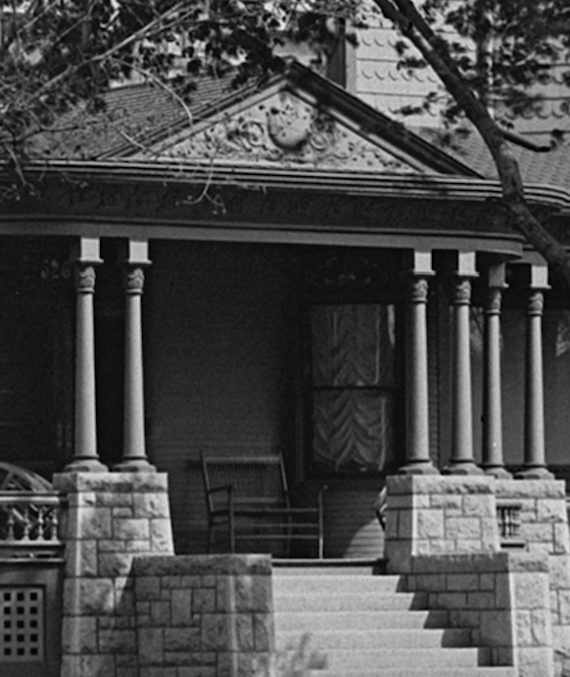 Image courtesy ESU Special Collections and Archives. 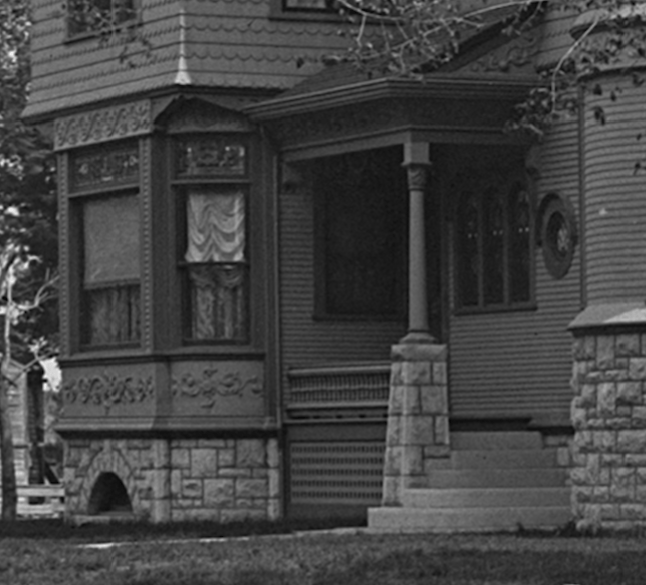 In this image, you can see the contrast between how the house was painted originally, and how it was later painted. The original color application is seen on the left, and to the right is a “painted lady” application done ten years ago. The latter look became popular in the 1960s when hippies started buying “gloomy old Victorians” and painting them in vivid colors, the more colors the better. 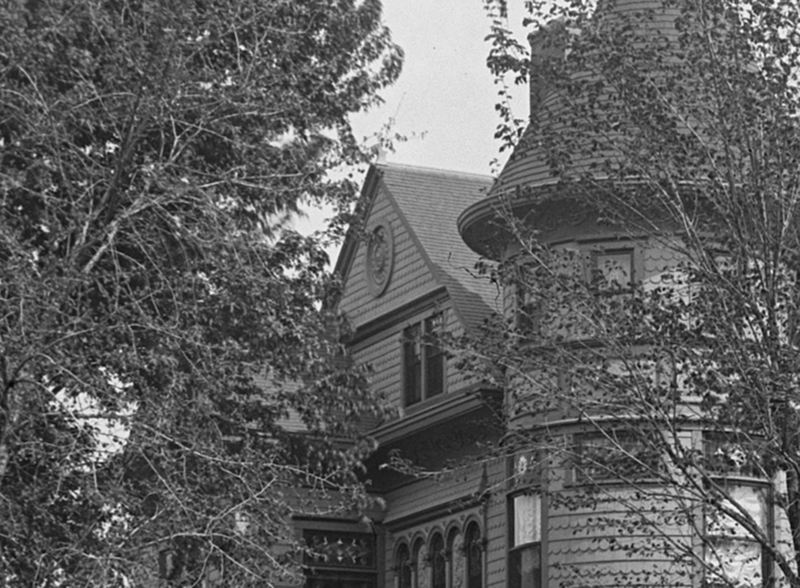 The “painted lady” effect (where every detail is picked out in contrasting colors) has, pretty much, become the default approach to old houses, even though the approach is historically inaccurate. 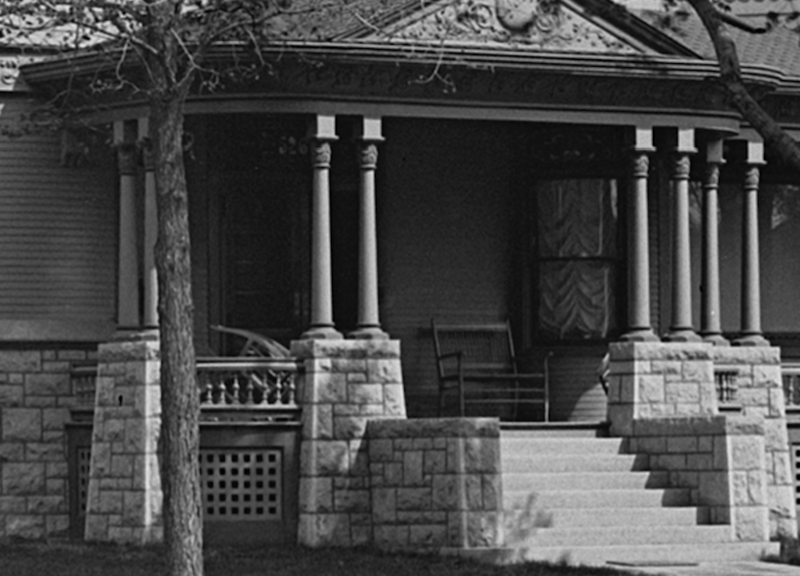 Houses in the late 19th- and early 20-century were normally painted in a 4-color scheme: sash color, wall color, trim color, and porch ceiling color. A “painted lady”. This house would have looked nothing like this originally. 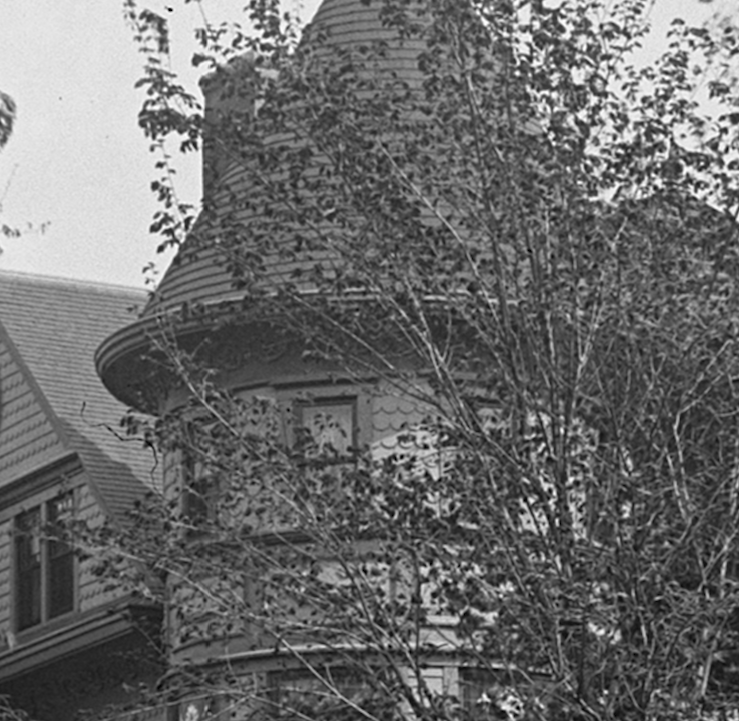 In this image of the Cross House (a close-up of the 1895 image, above), you can see how the huge and dramatic curved cornice of the Cross House, a signature feature, was painted a solid color. 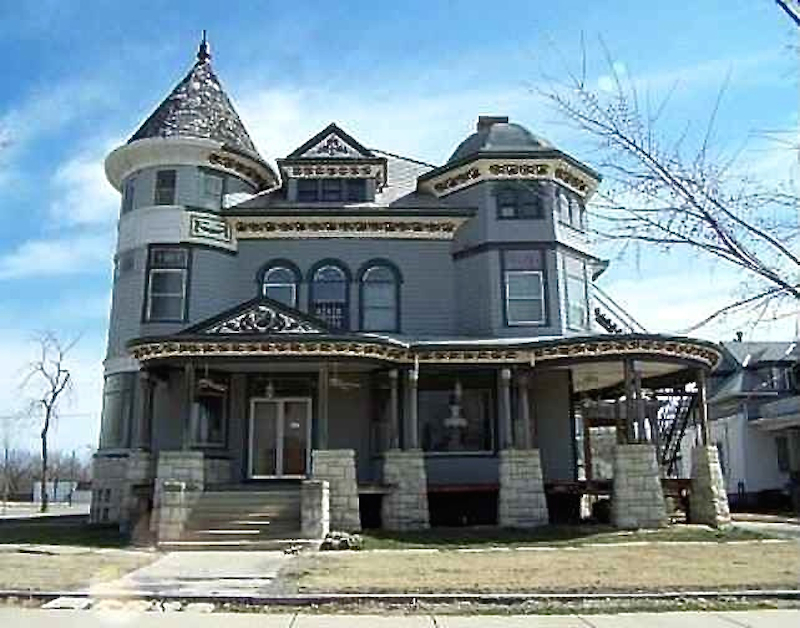 This is the house when I purchased it in March 2014. The “painted lady” aesthetic is evident. And the house last year. The application of colors (light, dark) were guided by the 1895 image. The result almost looks like a different house than the one I purchased. This week, I will be painting the “eye”, as seen in the upper gable. The big question: what should the colors be? …the decorative detailing in other areas were also, originally, painted the light wall color, rather then the darker trim color. Thus, I let the 1895 image inform my color decisions. And even though the highly decorative details are not “picked out” they are nonetheless highly visible. You can appreciate how the decorative details are picked out in the lighter wall color. Just for fun, this image shows a settee to the right, and an overturned rocker to the left. This image also reveals what a fraud I am. A fraud! For, see how the columns are the lighter wall color? I nonetheless painted them the darker trim color. I know, SHOCKING! A SCANDAL! I should be arrested for violating historic accuracy! I know! I know! But…although I did initially paint the columns the lighter wall color, and with the darker trim color for their bases and capitals, this looked, in the end…weak. So I made an executive decision to go all dark. I have not regretted this. 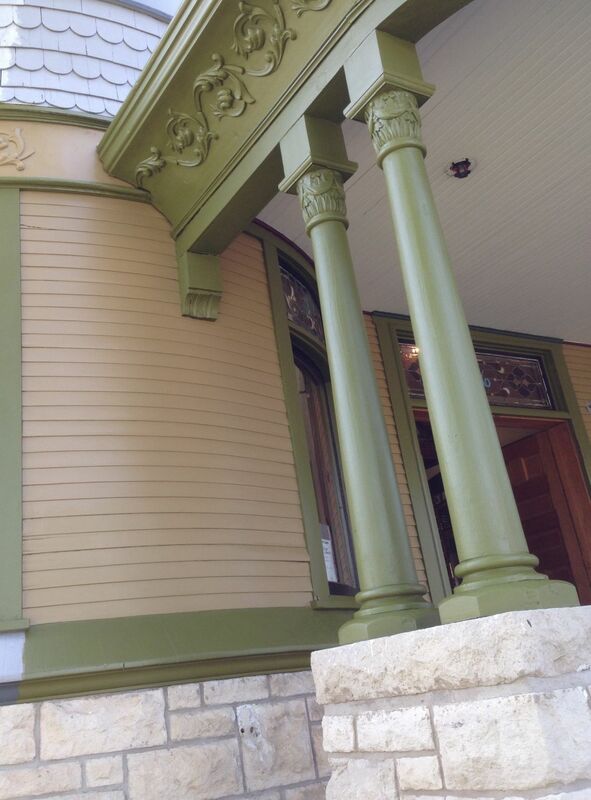 It is rare that a historic home is repainted in its original colors. 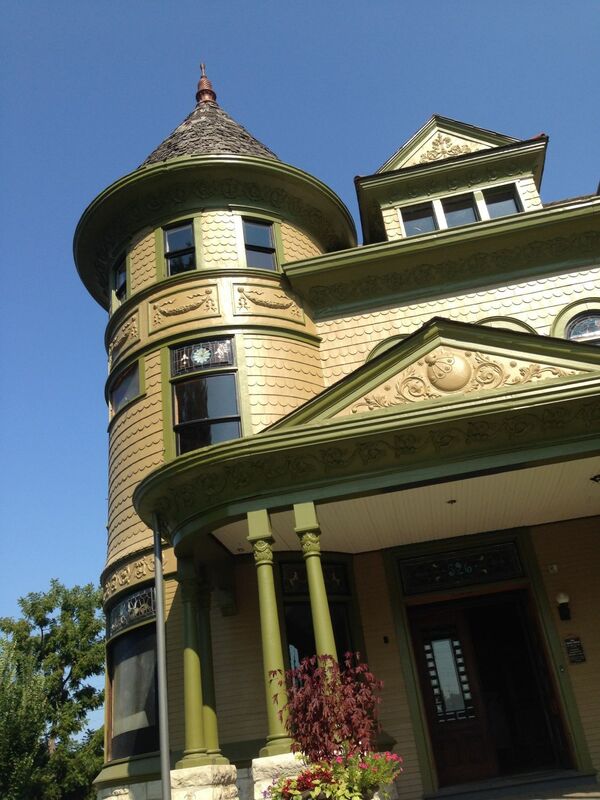 Most historic home owners go for a “painted lady” effect. And/or most owners select colors which they like. In a million years I would not have selected the colors I used in the end. Rather, the colors selected me, for I was highly focused on a single burning question: WHAT were the original colors???????? Because the house had been stripped of 99.9% of the old paint by the previous owner, I initially had zero confidence that I could ascertain the original colors. But, this proved an incorrect assumption, as bits were discovered which could be computer matched. So, even though in a million years I would not have selected the colors I eventually used, I am thrilled with the results. The colors superbly complement the limestone foundation, the oak entry doors, and stained-glass windows. I doubt, very much, that any alternative colors I selected would have proved so successful. Recently, a friend called me. 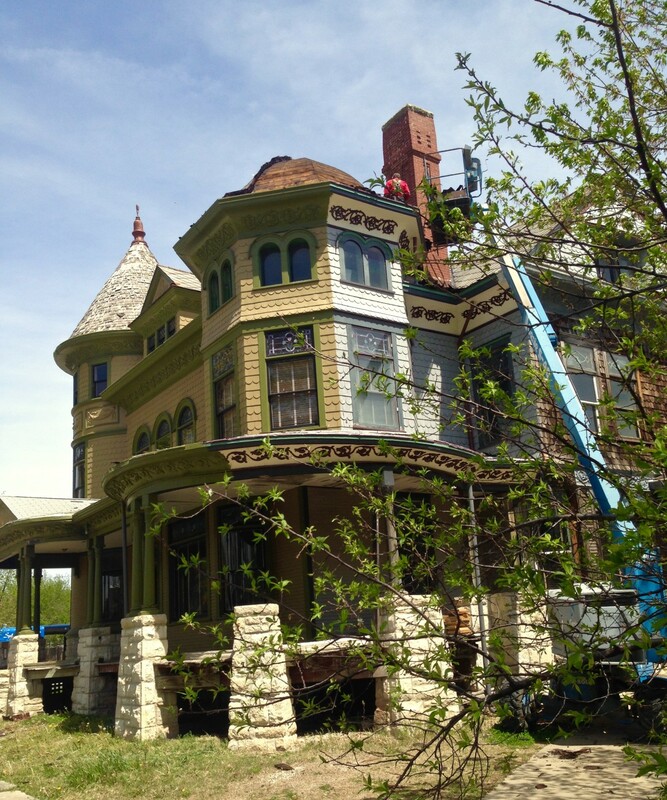 He owns an incredible historic house, and he and his wife are planning to repaint the exterior. A gargantuan project. “What colors would you recommend,” he asked? As we talked, he told me what colors he liked, and what colors his wife liked. I responded that he and his wife might well end up getting divorced over this issue, as their color preferences were so different! My friend had no idea. And it had never occurred to him to find out. While I was eager to default to The Original Colors, I support historic home owners who decide to paint their fabulous old house in colors which make them happy. Happy matters. Oh baby, happy sooooo matters. I wrote this post so that readers would learn of what guided me. But what worked for me might not work for others. I also wrote this post as a, well, suggestion. 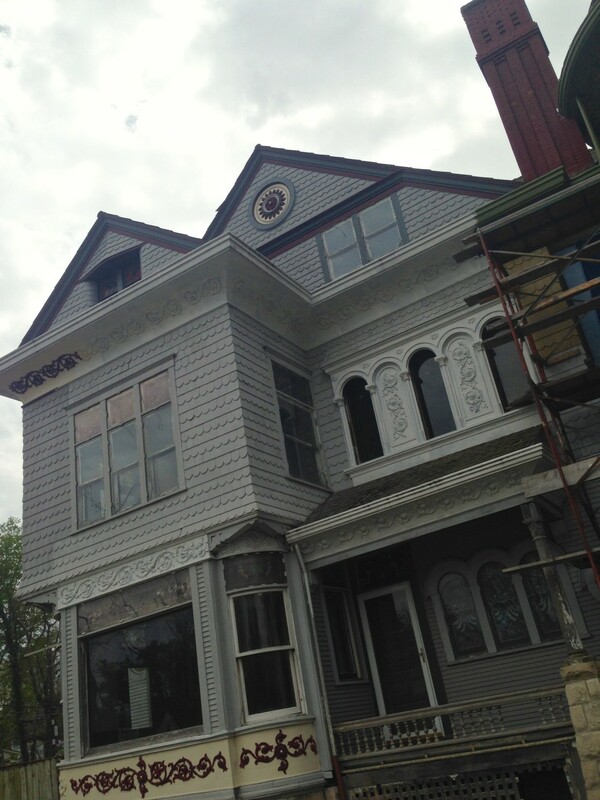 If you own a historic home, and wonder What To Do regarding painting your exterior, perhaps my experience will be helpful. Wish everyone that is working on a historic house would do this. It really helps motivate others to keep going. It’s interesting that the in areas of the Cross House that still have the previous paint job, the highlighted ornament actually looks flatter and less impressive than the restored color scheme. The red highlighting obscures all the depth and shadow. And….now we no longer have to wonder what color the eye will be!! What is really disturbing up here in boring old New England is that most old house owners paint their Colonials and Federals white. Not only is it wrong, it’s soporific. Paint samples under the clapboard on my 1835 Federal show it was always painted yellow with green shutters. White is as wrong as that old myth about Henry Ford always painting Model T’s black. The car buffs can’t let go of that one anymore than New Englanders can let go of the purity myth of white houses. I just moved into an apartment built in 1942. It’s probably the closest I’ll ever get to living in an historic property. While the entire apartment is eggshell with white trim, I was allowed to pick one accent wall. It took me hours to look at every possible color that Sherwin-Williams offered. I even looked at their historic colors, but none really spoke to me. I finally decided that the apartment and I would get along much better if I picked a color with my heart and not my head. In the end, I doubt my unit’s original occupants would have approved of “Mature Grape” for their living room, but every time I look at my wall I smile. Like you said, sometimes you have to make yourself happy. The house is looking great! I am curious what your intentions are about the porch railings; from the old pictures, it looks as though the originals were barely knee-high. Does your insurance company or city hall have height requirements? I am asking because we ran into the same issue a few years ago. 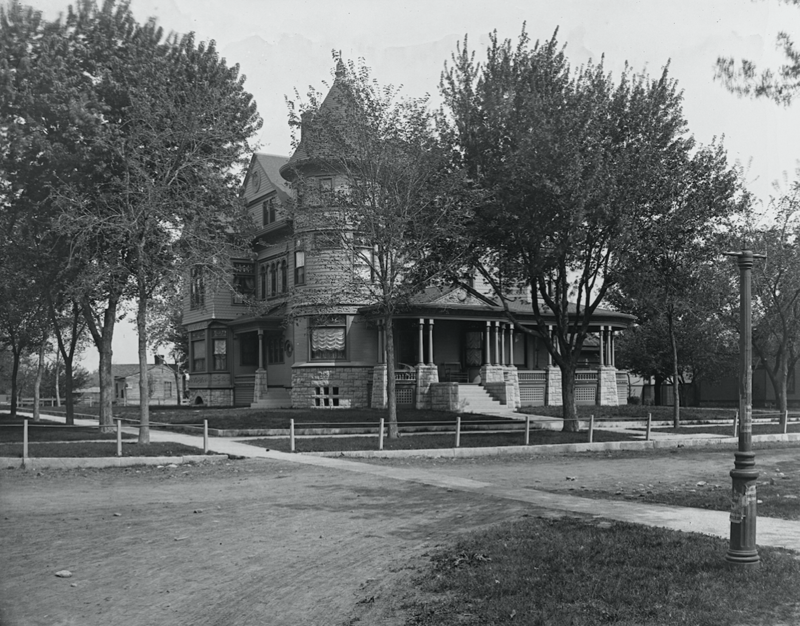 After we bought our 1894 house, our insurance agent sent exterior pictures to the company’s “HOME OFFICE”, and they gave us a 30 days to replace the short railings with ones that were, best I recall, at least 36″ from the floor to the top rail. Fortunately, the old rails were not original and needed replaced anyway, so the only grief was having to undertake the project in winter instead of the next spring as I had planned. We were lucky that the “HOME OFFICE” did not require interior pictures, as our beautiful and intricate staircase bannister is only 32″ high. 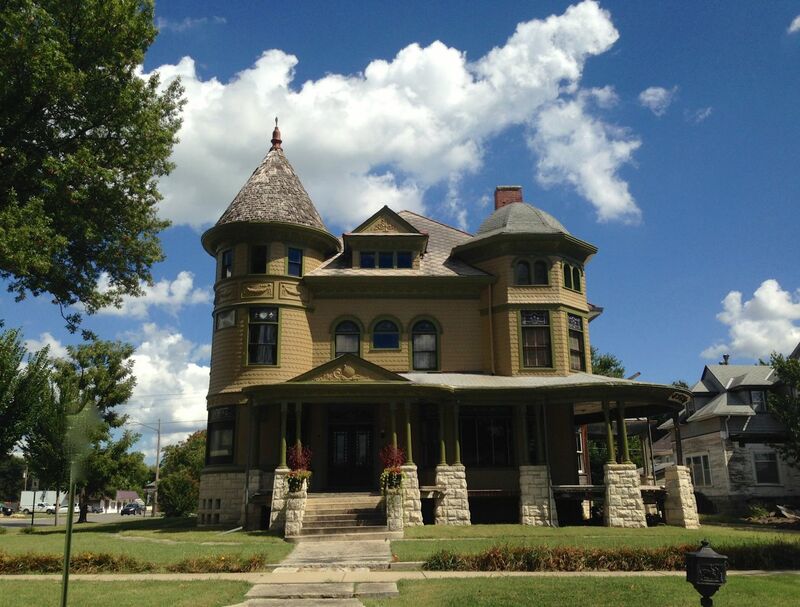 Because the house is deemed historic, it is exempt from certain local code requirements. 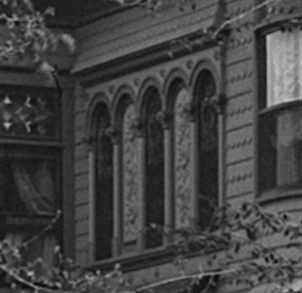 Thus I can recreate the lost porch railings exactly as seen in the 1895 image. I had the original railings, and spindles, all copied. Waiting for the spindles now! 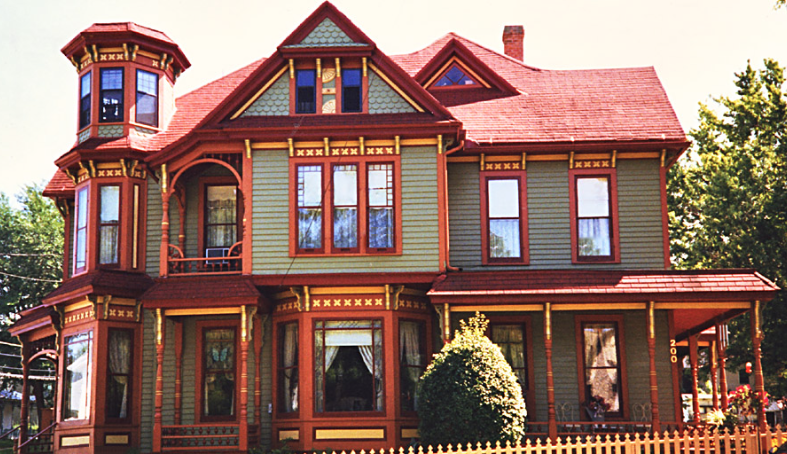 36-inch railings look REALLY odd on a historic house. I have seen people recreate the original low railings, then run a steel wire at 36-inches to comply with codes. The wire is not readily obvious, so the original look is largely maintained. I wish I had found your blog when I tried to select the colors for my house. I am pretty happy with what I selected, but if I had to do it all over again, I would have gone original. 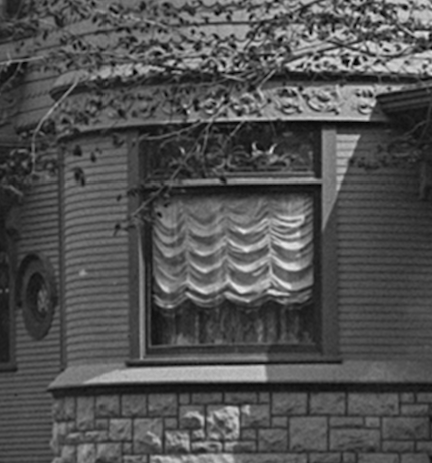 Hi Ross, I was curious as to why you you have removed the six panels under the center window of the front of the Cross House? I saw that they clearly existed when you bought the house in 2014. Am I missing anything like if they might not be original? Thank You! The six panels were totally rotted, because such a paneled design is intended for an interior application, not exterior. The design attracted water rather than shed it. All the wood, which came out by hand, was also not original, having been replaced who-knows-how-many-times over the past 120-years. So, I shingled over the area as an interim solution, and am trying to figure out a way to recreate the look while shedding water. Do you have a good pic of the detail David is talking about? The “six panels” and is there any of it left? I just stumbled across an 1884 paint color book (Town and country house painting: thirty-five colored illustrations showing the effect of various combinations of colors on houses, cottages and villas…) which seems like a great source of inspiration if you can’t find your house’s original colors. You can view it here. I’ve really enjoyed following your blog thus far- it’s detailed, fun, and makes our own old house renovations seem so much more ‘doable’ by comparison! One observation: in the original tower pic above where you mentioned the curved cornice-following your astute observations on ‘light’ vs ‘dark’ it appears the swag detail between the 2nd and 3rd was light, but had a darker thicker trim color in the body surrounding it- a contrast from your all light body…Perhaps another ‘executive decision’ on your part, or perhaps another minor detail discovery? In any event, keep up the creative writing and enjoy your progress! And you have a good eye! The swag detail (between the second- and third-floor of the tower) was tricky. It looks like the swags, and their immediate rectangular background, were the wall color originally. As they are now. The rectangles have raised metal trims, and these looked to be the darker trim color. As they are now. But the flat sheet metal surrounding the rectangles does appear, appear, to be a intermediate color. A mysterious fourth color! The sheet metal surround color also might, might have just been the darker trim color. I painted a section like this, and it chopped the soaring tower in two. It looked like it had a, ah, girdle on it! However, without knowing for sure what the color was, I went ahead and painted the sheet metal the wall color. I like the result, and the tower just soars! When you first started painting the house I wasn’t sure what to think. It has really grown on me, though, and looks gorgeous. I totally hate when people go for the painted lady look..There is this 1890 queen Anne house where I live that is painted like a mustard yellow and a purple pink color and they are trying to say oh that’s the original colors..I have seen only two older pictures of this house that are of course black and white but there is no way that what it is now are original..wish I could link it somehow to show you the before and after photos but I don’t know how.It’s on Facebook under maple street mansion. Just a thought, could you have the panels under the center of three windows made in resin? That would solve the water issue, and you used it for the porch column tops. The original colors make the details pop much better than the multi-color approach.